Any job search brings its share of anxiety, and for good reasons. Based on eye-tracking studies, average recruiters spend only six seconds reviewing an individual resume. In addition, the average U.S. interview process drags on for an extra 10 business days compared to the typical cycle just a few years ago. One universal truth for any job search is that you can’t go it alone. Professional colleagues past and present pave the way to corporate connections, and these connections will often lead to the position you’re seeking. That’s why it’s essential to maintain an active presence on social media. Virtual networks expand the reach of your unique personal brand. LinkedIn is widely regarded as the standard for sharing your business background and accomplishments with peers and contacts. And LinkedIn is the first place recruiters or hiring managers look after an initial interaction with a job candidate. Make sure that your LinkedIn profile features a business-appropriate photo. Your profile should also include the latest details on your experience (embedded with industry-relevant keywords), an accurate presentation of your skills, supporting endorsements and recommendations, and contact information. Other social media platforms offer avenues you can use to refine and support more specialized activities. For instance, you might search Twitter by hashtag-company name (e.g., #AccountingPrincipals) to find more information. Keep in mind that recruiters interact daily with employers in your desired field. Why not leverage their inside expertise? Recruiters can provide vital intelligence on the market you’re pursuing. They know things like up-to-date salary trends, direction on which companies are hiring, access to unpublicized job postings and guidance on interview preparation. If you don’t have a recruiter, ask your professional network for recommendations, advises technology recruiter Jamie Chafel. “Don’t commit until you’ve found one who can be effective and who you can trust to have your best interests in mind,” he adds. Online job applications are convenient, but remember that they often flow directly to a computerized applicant tracking system (ATS). An ATS scans applications for keywords and phrases. You could be out of the running before your resume meets the eyes of a human. Increase your chances by reaching out to people who already work at the desired company. Request an informational interview. A good approach, whether by email or phone, is to convey that you’re thinking of a career change and would like to find out more about the company. If you get a positive response, be mindful of the interviewee’s time by preparing questions ahead of time. Follow up with a personal thank-you note. This type of engagement sets you apart from applicants flagged by the ATS. Get yourself noticed by people who influence the interview and hiring process. While it’s always great to get help from others, be sure to use any remaining free time to dive deeper into research. As a starting point, take a look at the Bureau of Labor Statistics’ hiring forecasts and educational/training requirements for specific job titles. Career consultant Amy Lindgren also recommends plugging job titles into general search engines to find links to relevant professional associations devoted to your field. Bookmark key pages for later review. 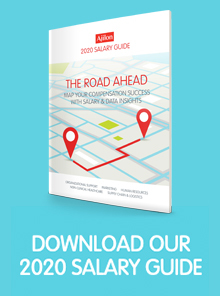 When your search becomes well defined, use tools such as this online salary calculator. These will help you find out what you should expect to be paid for a specific job title in your preferred geographic location and company size. Government agencies collaborate with local businesses, often at job fairs, to stimulate hiring of area residents. Look up your county’s employment services website to find out about upcoming events. In some parts of the country, like Gloucester County, New Jersey, for example, the government goes a step further. They post job openings from regional employers and update it every two weeks. Other assistance, such as employment counseling and interview workshops, may be available at no charge to residents. Stay current with workplace and hiring trends focused on the office/administrative, HR, supply chain/logistics and non-clinical healthcare specialties by reading Ajilon’s Job, Career and Recruitment Blog.